Pirates are only 8 games out and they're on a streak. They're still in it. I was speaking of the twenty year drought, Goose. Prolonged heartache. Yeah. 20 years can be painful. When I was a boy I remember when the Pirates bested San Francisco, and won the NL Pennant in what was then just East and West in each league. Way back in 1971. Pittsburgh won the series, 3–1. 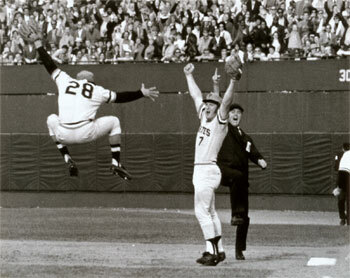 Pittsburgh went on to defeat the Baltimore Orioles in the WS, 4-3. Post Season Schedule here. I wonder if the Cubs can repeat. Any here particularly excited about post season Major League Baseball, which is in full swing now?